I'm interested in upgrading to LED front signals. I'm hoping that some of y'all are willing to share some tips and tricks. Does anyone have any tips for removing the front signal unit (stalk and all). The single screw on the inside of the fairing is super-tight on both left and right side on my bike. Do I need to loosen that to start the removal process? FYI: I just ordered a service manual, but it won't arrive for another week. 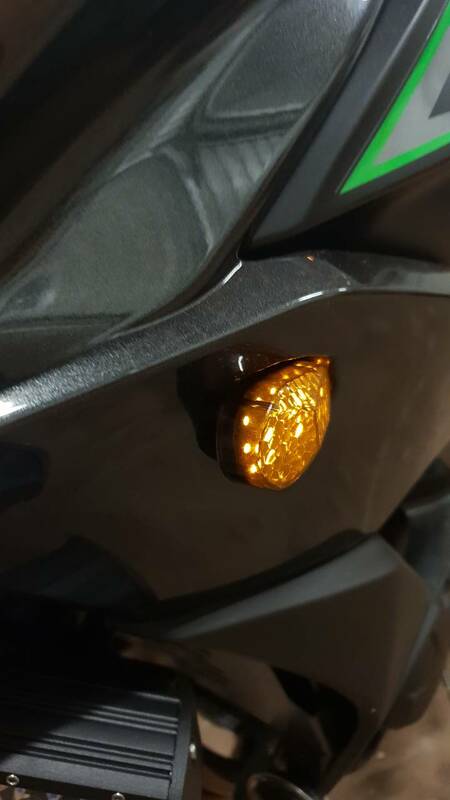 For standard 10mm aftermarket light stalks, is an adapter plate needed on the inside of the fairing? I've found several adapter plates for V-650, but not for model year 2015. Thanks in advance for tips/tricks/advice! FIRST - I suggest you buy some JIS bits (Japanese BETTER "Philips"...), as Philips do NOT fit them properly. I used a 1/4" drive ratchet w/ the appropriate JIS bit (NOT a Philips screwdriver!) and those screws were an 'EASY' remove. I had so much trouble trying to find those plates that I cut my own in a piece of somewhat rigid black plastic (garbage bin). The outside plate is a lot of work to fit well, the inside plate can be oversized without issue. The metal clamp you have issue removing must be removed, AND there is an inner plate too to remove from inside the stalk (into which that screw comes out). (fyi the rubber stalk is so rigid that I never put them back). Most Chinese led crap at low price will be way too dim and you`ll get in trouble, especially the flush-mount kind. Be ready to try many if you don`t invest in good ones. The next problem is that they will blink too fast, if at all, so you need en electronic relay to pace them correctly. That took a while to arrive. Finally, the 3rd problem is the cable adapter; the kawi terminals is not the usual 2 round prongs that you find on 3rd party turn signals. You will have to find the adapter cables (2) if the turn signal model is not already equipped with the proper terminal. I am really happy with my Yamaha LED plus indicators, been riding with these for a few weeks and they really stand out. I also installed dimmers that are being made by a Polish dude on Ebay which will dimm the drl's when the indicators are being used. Not cheap but indicator and drl's in 1 - can't beat that combo. Urbanengineer and Rpope901 like this. I bought some super cheapies off AliExpress, something like $12 for all four. They work great and were basically plug and play. And that was on a Gen 1. Got some news for yall...all LEDs are made in China! quexpress, jaaklucas and Urbanengineer like this. LED units like linked above in the video will be leaps and bounds better than drop in LED bulbs and be about the same price. Very impressive stuff! Exactly, they are really bright and stand out perfectly. I always want to try the cheap way first and it always dissapoints me, wheter it will be wire (always a lot thinner then expected) LED driving lights (never live to be 1 year old before they collapse or just desintegrate, mirrors (rusting, buzzing, impossible to mount really thight, LED bulbs (to dim or just die within weeks), fuse box (oxidating). I'm done with the el cheapo way, to much headaches and money over the bridge, not mentioning the wasted time for redoing them again and again. For the handguards -> Barkbuster storm with the additional LED DRL's and indicators. Indicators -> Yamaha LED plus which also have a additional DRL in the front and the back has added brake function. Fusebox -> Rowe PDM60 which does all the stuff i want like delayed power on. I know everything is probably made in China anyway but there is a difference in quality controle, used LED's and warranty. *ps, and those Yamaha indicators look beautifull on my Versys ! quexpress and Urbanengineer like this. Last edited by Freubel; 08-05-2018 at 10:27 AM. R&G Racing. They make very nice metal mini-sized turn signals with LEDs. When you tip your bike over, the front OEM size signals hit the pavement and crack the expensive fairing. R&G also makes a nifty adapter plate ready to drop right in. You can find inexpensive resistor adapters which plug into the factory harness and then you plug in the LED signals to match the flash rate. The connectors on the 2015 V650 are the bullet type. The R&G LED signals are quite a bit brighter than factory. The mini size does not reduce their visibility at all. For the rear signals idk what is a good LED replacement. Since the size of the stalk is not an issue, I'd just put in LED bulbs rather than replace the entire unit. It replaced my stock front indicators with flush mounts but they Don fit properly on my 2017. Anyone have any suggestions? Which turn signals are those on the fairing? They are the flush mounts I got. But as you can see they are on backwards cause they don't fit properly. Even backwards they stick out at the front.